Bisate is located in the natural amphitheatre of an eroded volcanic cone, with dramatic views of the peaks of the Bisoke and Karisimbi volcanoes rearing up through Afro-alpine forests. 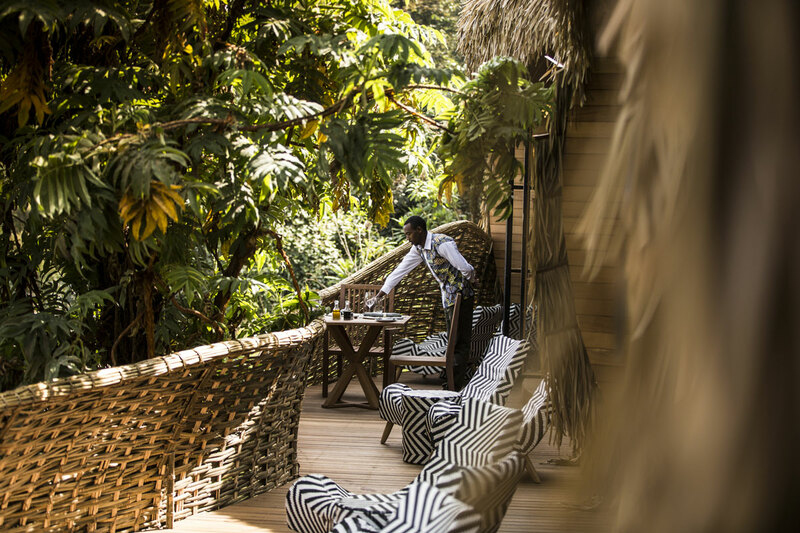 Bisate Lodge has dramatic views of the Bisoke and Karisimbi volcano peaks rising through the forests of nearby Volcanoes National Park. It is within easy driving distance ofPark Headquarters, from where once-in-a-lifetime gorilla treks depart daily. Exploring around Bisate includes community visits, birding, golden monkey tracking, and helping reforest thearea, Gorilla Guardian Village, the Twin Lakes of Ruhondo and Burera, and Dian Fossey’s grave. Bisate is situated close enough to Kinigi (Park Headquarters) to be convenient for your morning gorilla trek rendezvous, however, far enough away so as to feel remote and even part of the spectacular Volcanoes National Park. 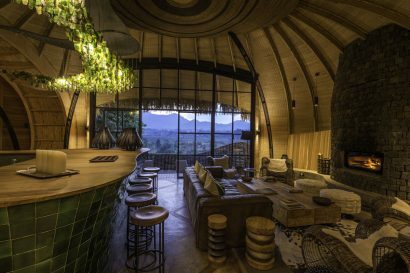 The Bisate property covers 42 hectares (103.78 acres) of intriguing and varied topography that shield and protect the lodge from any unnatural disturbance. 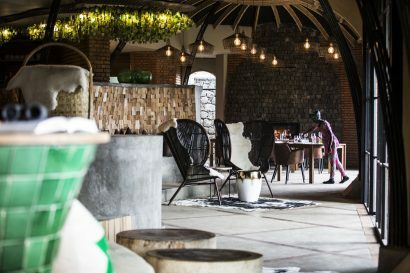 Bisate aims to enrich the gorilla viewing experience for its guests by providing depth and knowledge through evening presentations and informal chats with an on-site gorilla expert, researcher or scientist who will share his or her knowledge with guests about these charismatic creatures. • Nature walks and birding walks guided in the forest on the property. • Guided nursery visit (meet our agronomist) and indigenous tree planting. One pair of garden gloves (Bisate has a supply should guests wish to borrow some). • Guided walks of the surrounding communities to meet with our neighbours (learn about their family lifestyles, community work and farming practices). • Running trail (at own risk as there are no guides on the trail). • “Gym in a bag” in the villas. • Sundowner drinks on the lodge balcony or the private balcony at the villa, with views of the volcanoes. • Guided visits to park reforestation site. • Guided visits to Bisate Primary and Secondary schools (the schools are closed over weekends and during school holidays). • Guided visit of Bisate Village. Purpose: The aim of Bisate is to be a model of sustainable ecotourism in Rwanda. Its reforestation and rehabilitation project has each guest partnering with us in contributing to conservation and local community up liftment, with a positive impact on the iconic endangered mountain gorilla. • As the minimum age for gorilla tracking is 15 years, only children of 15 years and older are allowed at Bisate. 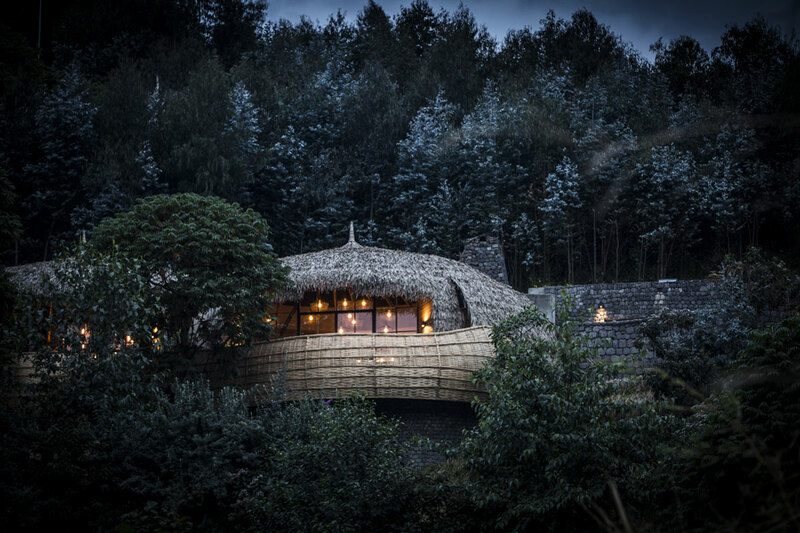 Each 91 square metre Forest Villa consists of a generous yet intimate combination of bedroom, reception space and bathroom, all warmed by a central fireplace and with breath taking views out across your private deck towards Mount Bisoke. 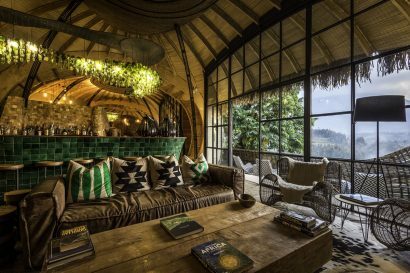 With only six villas, the real generosity in the Rwandan context is the amount of private and exclusive space that surrounds Bisate, cosseting it in a rare natural landscape brimming with Albertine Rift biodiversity and beauty. 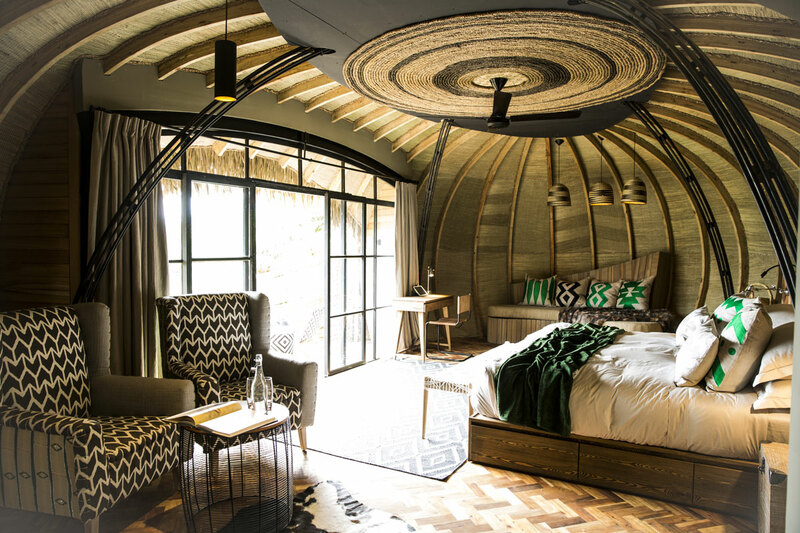 This camp can accommodate 12 guests and 04 guide/pilot/tour leaders sharing. • 06 x twin-bedded villas, with double bed conversions possible. • 02 x single rooms with a twin bed each and separate en-suite facilities (not of the same standard as a guest villa). • En-suite facilities with indoor shower, bath and double basin vanity, heated towel railing, separate toilet, fireplace, easy chairs, luggage rack, tea and coffee making facilities, electronic safe and mini-bar. • Complimentary wireless internet connection in villa only. 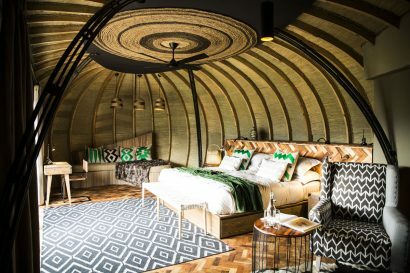 • Two way emergency radios have been fitted in the villas at Bisate and may be used by guests to contact camp management in the event of an emergency only. Said radios are on a closed circuit and inter-villa communication is not available. 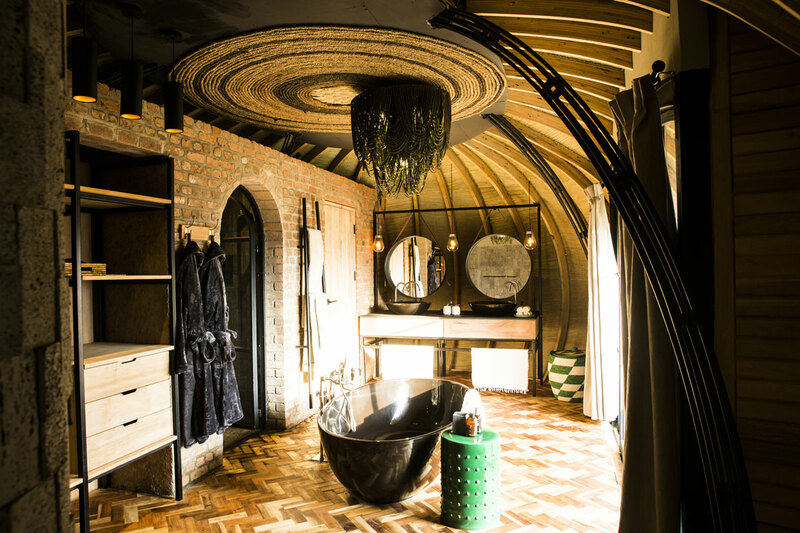 • Amenities include, bathrobes, slippers, liquid soap, shampoo and conditioner, body lotion, insect repellent, shower caps, vanity kit with cotton tipped swabs and cotton balls, tissue dispenser, washing powder (for smalls), umbrella and room spray are supplied in each villa. • Main lounge, dining area with central fire place and bar area with viewing deck. • In-villa massage treatments (at an additional cost). 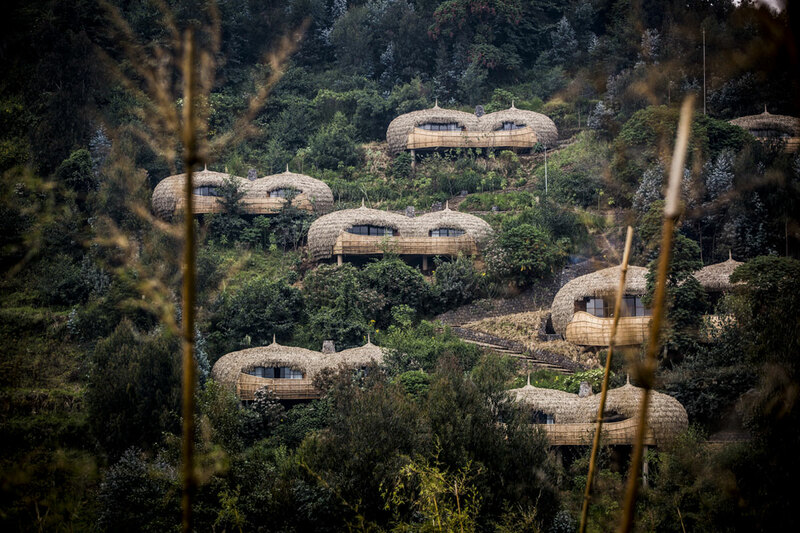 • Mountain Gorilla Conservation: Bisate aims to become a Centre of Excellence for great ape research, focusing on mountain gorillas and ultimately growing a local, sustainable conservation-based economy. 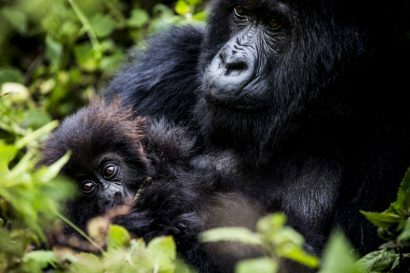 This purpose, it is hoped, will facilitate an increase in the population of Critically Endangered mountain gorillas in Rwanda. • Community Partnership: Through our partnership with the surrounding community, including the purchase of the Bisate site from 103 community members and injecting $500 000 into the community, over 200 people from the local community were employed for the property’s construction while another 24 community members are permanently employed at Bisate. A community cooperative has been formed for equitable procurement of fresh produce and other goods from land adjacent to the site. • Habitat Restoration: One of our most exciting initiatives is the reforestation of 43 hectares (103 acres) of Bisate land in a phased approach. This area is set to mimic the volcanoes’ natural vegetation zones with a bamboo forest at the lower level, while further up, Hagenia and Dombea trees, amongst others, will help to recreate the indigenous rainforest, leading to a natural recolonisation of the reforested land by birds and animals. 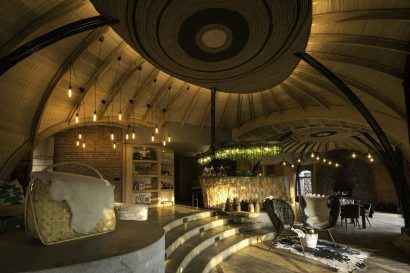 • ‘Every guest a philanthropist’: To date we have planted more than 20 000 indigenous trees on Bisate’s site. 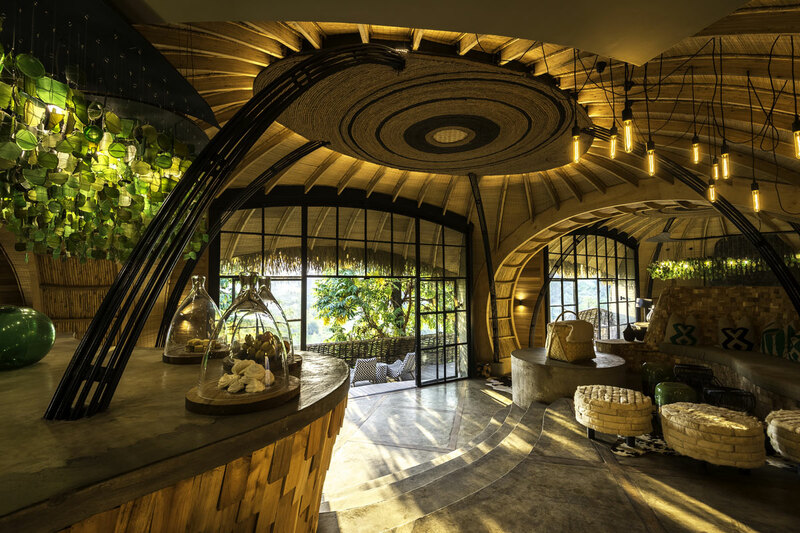 To continue our reforestation initiative, we encourage our guests to spend time in the tree nursery and to plant a tree during their stay, thus contributing directly to the restoration of the area.